A former Research Fellow at Chatham House and the ex-Director of the World Development Movement, British historian Mark Curtis has published several books on UK foreign policy, including 2003’s Web of Deceit: Britain’s Real Role in the World, endorsed by Noam Chomsky and John Pilger. Ian Sinclair asked Curtis about the recently published new edition of his 2010 book Secret Affairs: Britain’s Collusion with Radical Islam. Ian Sinclair: With the so-called ‘war on terror’ the dominant framework for understanding Western foreign policy since 9/11, the central argument of your book – that Britain has been colluding with radical Islam for decades – will be a huge shock to many people. Can you give some examples? Mark Curtis: UK governments – Conservative and Labour – have been colluding for decades with two sets of Islamist actors which have strong connections with each other. In the first group are the major state sponsors of Islamist terrorism, the two most important of which are key British allies with whom London has long-standing strategic partnerships – Saudi Arabia and Pakistan. The second group includes extremist private movements and organisations whom Britain has worked alongside and sometimes trained and financed, in order to promote specific foreign policy objectives. The roots of this lie in divide and rule policies under colonialism but collusion of this type took off in Afghanistan in the 1980s, when Britain, along with the US, Saudi Arabia and Pakistan, covertly supported the resistance to defeat the Soviet occupation of the country. After the jihad in Afghanistan, Britain had privy dealings of one kind or another with militants in various organisations, including Pakistan’s Harkat ul-Ansar, the Libyan Islamic Fighting Group and the Kosovo Liberation Army (KLA), all of which had strong links to Bin Laden’s al-Qaida. Covert actions have been undertaken with these and other forces in Central Asia, North Africa and Eastern Europe. For example, in the 1999 Kosovo war, Britain secretly trained militants in the KLA who were working closely with al-Qaida fighters. One KLA unit was led by the brother of Ayman al-Zawahiri, then Bin Laden’s right-hand man. The British provided military training for the KLA at secret camps in Kosovo and Albania where jihadist fighters also had their military centre. The ‘dirty secret’ of the July 2005 London bombings is that the bombers had links with violent Islamist groups such as the Harkat ul-Mujahidin whose militants were previously covertly supported by Britain in Afghanistan. These militant groups were long sponsored by the Pakistani military and intelligence services, in turn long armed and trained by Britain. If we go back further – to the 1953 MI6/CIA coup to overthrow Musaddiq in Iran – this involved plotting with Shia Islamists, the predecessors of Ayatollah Khomeini. Ayatollah Seyyed Kashani – who in 1945 founded the Fadayan-e-Islam (Devotees of Islam), a militant fundamentalist organization – was funded by Britain and the US to organise opposition and arrange public demonstrations against Musaddiq. Although Britain has forged special relationships with Saudi Arabia and Pakistan, it has not been in strategic alliance with radical Islam as such. Beyond these two states, Britain’s policy has been to collaborate with Islamist extremists as a matter of ad hoc opportunism, though it should be said that this has been rather regular. Whitehall does not work with these forces because it agrees with them but because they are useful at specific moments: in this sense, the collaboration highlights British weakness to find other on-the-ground foot soldiers to impose its policies. Islamist groups appear to have collaborated with Britain for the same reasons of expediency and because they share the same hatred of popular nationalism and secularism as the British elite. IS: Why has the UK colluded with radical Islamic organisations and nations? MC: I argue that the evidence shows that radical Islamic forces have been seen as useful to Whitehall in five specific ways: as a global counter-force to the ideologies of secular nationalism and Soviet communism, in the cases of Saudi Arabia and Pakistan; as ‘conservative muscle’ within countries to undermine secular nationalists and bolster pro-Western regimes; as ‘shock troops’ to destabilise or overthrow governments; as proxy military forces to fight wars; and as ‘political tools’ to leverage change from governments. This collusion has also helped promote two big geo-strategic foreign policy objectives. The first is influence and control over key energy resources, always recognised in the British planning documents as the number one priority in the Middle East. British operations to support or side with Islamist forces have generally aimed at maintaining in power or installing governments that will promote Western-friendly oil policies. The second objective has been maintaining Britain’s place within a pro-Western global financial order. The Saudis have invested billions of dollars in the US and British economies and banking systems and Britain and the US have similarly large investments and trade with Saudi Arabia; it is these that are being protected by the strategic alliance with Riyadh. IS: You include a chapter in the new edition of the book exploring the UK and West’s role in Syria. Simon Tisdall recently noted in The Observer that the West has been “hovering passively on the sidelines in Syria”. This is a common view – including on the Left. For example, in September 2014 Richard Seymour asserted “The US has not been heavily involved” in Syria, while in February 2017 Salvage magazine published a piece by Dr Jamie Allinson, who argued it was a myth that “the US has pursued a policy of regime change” in Syria. What is your take on the West’s involvement in Syria? MC: These are extraordinary comments revealing how poorly the mainstream media serves the public. I’ve tried to document in the updated version of Secret Affairs a chronology of Britain’s covert operations in Syria to overthrow the Assad regime. These began with the deployment of MI6 and other British covert forces in 2011, within a few months after demonstrations in Syria began challenging the regime, to which the Syrian regime responded with brute force and terrible violence. British covert action, mainly undertaken in alliance with the US and Saudi Arabia, has involved working alongside radical and jihadist groups, in effect supporting and empowering them. These extremist groups, which cultivated Muslim volunteers from numerous countries to fight Assad, have been strengthened by an influx of a massive quantity of arms and military training from the coalition of forces of which Britain has been a key part. At the same time, Britain and its allies’ policy has prolonged the war, exacerbating devastating human suffering. UK support for Syrian rebel groups long focused on the Free Syrian Army (FSA), described by British officials as ‘moderates’. Yet for the first three years of the war, the FSA was in effect an ally of, and collaborator with, Islamic State and al-Qaida’s affiliate in Syria, al-Nusra. London and Washington continued to provide training and help send arms into Syria despite the certainty that some would end up in the hands of jihadists. Some of the militants who joined the Syrian insurgency with British covert support were Libyans who are believed to have been trained by British, French or US forces in Libya to overthrow Qadafi in 2011. Some went on to join Islamic State and also al-Nusra, which soon became one of the most powerful opposition groups to Assad. Britain appears to have played a key role in encouraging the creation of the Islamic Front coalition in Syria in November 2013, which included groups which regularly worked with al-Nusra; these included Liwa al-Tawhid – a group armed by Qatar and which coordinated attacks with al-Nusra – and Ahrar al-Sham – a hardline Islamist group that rejected the FSA. Both groups contained foreign jihadists, including individuals from Britain. Ahrar al-Sham’s co-founder, Abu Khalid al-Suri, was linked to the 2004 Madrid bombing through a series of money transfers and personal contacts; a Spanish court document named him as Bin Laden’s ‘courier’ in Europe. The same network was connected to the 2005 London terror attack. The UK role in Syria has not been minor, but has been an integral part of the massive US/Arab arms and training operations, and British officials have been present in the control rooms for these operations in Jordan and Turkey. Britain also consistently took the lead in calling for further arms deliveries to the rebel forces. British covert action was in the early years of the war overwhelmingly focused on overthrowing Assad: evidence suggests that only in May 2015 did UK covert training focus on countering Islamic State in Syria. IS: What role has the mainstream media played with regards to Britain working with radical Islam? MC: It has largely buried it. In the period immediately after the 7/7 bombings in 2005, and more recently in the context of the wars in Libya and Syria, there were sporadic reports in the mainstream media which revealed links between the British security services and Islamist militants living in Britain. Some of these individuals have been reported as working as British agents or informers while being involved in terrorism overseas and some have been reported as being protected by the British security services while being wanted by foreign governments. This is an important but only a small part of the much bigger picture of collusion which mainly concerns Britain’s foreign policy: this is rarely noticed in the mainstream. 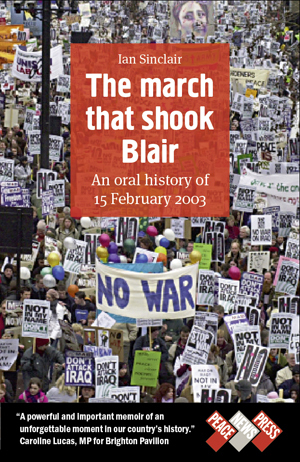 IS: The British public and the anti-war movement are not mentioned in your book, though they seem a potentially important influence on the nefarious and dangerous British foreign policies you highlight? MC: Yes, it’s largely down to us, the British public, to prevent terrible policies being undertaken in our name. We should generally regard the British elite as it regards the public – as a threat to its interests. The biggest immediate single problem we face, in my view, is mainstream media reporting. While large sections of the public are deluged with misreporting, disinformation or simply the absence of coverage of key policies, there may never be a critical mass of people prepared to take action in their own interests to bring about a wholly different foreign policy. The mainstream media and propaganda system has been tremendously successful in the UK – the public can surely have very little knowledge of the actual nature of British foreign policy (past or present) and many people, apparently, seriously believe that the country generally (although it may make some mistakes) stands for peace, democracy and human rights all over the world. When you look at what they read (and don’t read) in the ‘news’ papers, it’s no surprise. The latest smears against Corbyn are further evidence of this, which I believe amounts to a ‘system’, since it is so widespread and rooted in the same interests of defending elite power and privilege. The other, very much linked, problem, relates to the lack of real democracy in the UK and the narrow elitist decision-making in foreign policy. Governments retain enormous power to conduct covert operations (and policies generally) outside of public or parliamentary scrutiny. Parliamentary committees, meant to scrutinise the state, rarely do so properly and almost invariably fail to even question government on its most controversial policies. Parliamentary answers are often misleading and designed to keep the public in the dark. Past historical records of government decision-making are regularly withheld from the public, if not destroyed to cover up crimes. British ‘democracy’, which exists in some forms, otherwise resembles more an authoritarian state. There are fundamental issues here about how policy gets made and in whose name. It’s not an issue of whether Labour or Conservative is in power since both obviously defend and propagate the elitist system. Jeremy Corbyn himself represents a real break with this but the most likely outcome, tragically, is that the Labour extremists (called ‘moderates’ in the mainstream) and the rest of the conservative/liberal system which believes in militarism, neo-liberalism and the defence of privilege, will prevail if and when Corbyn becomes Prime Minister. The signs are already there in the Labour manifesto for the last election, which would have continued the present extremism in most aspects of UK foreign policy, even if it promised some change and still represented a major challenge to the establishment. Again, it will obviously be up to us to change policies, democratize the media and transform British governance more broadly. This entry was posted in Media, Protest/activism, UK Foreign Policy, US Foreign Policy and tagged Afghanistan, Jamie Allinson, Jeremy Corbyn, Kosovo, Libya, Mark Curtis, Media, Richard Seymour, Saudi Arabia, Syria, UK foreign policy, US foreign policy, War on Terror on April 6, 2018 by ianjs2014.